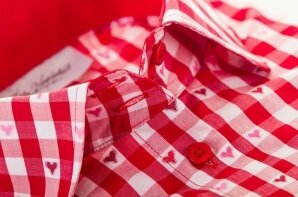 Red checkered dress shirt Bonn puts you in a carefree mood on your days off and adds color and joy to your office outfit on workdays. The highquality cotton makes long office days comfortable. Wear it either buttoned-up or loosely over a T-shirt. This fitted, long length shirt is perfect for average height and taller women (168–183 cm/ 5’6”–6’0”). Compared to the Italian fit shirts, it has more room for shoulders and bust and a well-defined waistline. Hourglass-shaped figure (bust and hips are balanced, waist is well defined).